Jobs are scarce, agriculture is in crisis, unorganised sector crippled, tax regime sputtering, corporate sector struggling and exports sinking. 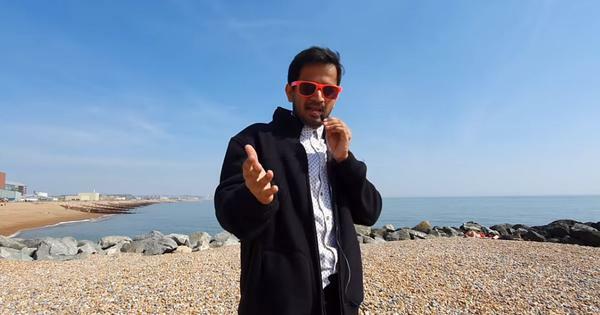 In the early days of this millennium, NR Narayana Murthy, architect of the inspiring Infosys success story, was asked about the secret behind his company’s remarkable wealth creation, and resulting adulation, among investors. He remarked in his trademark pithy style: under-promise and over-deliver. This anecdote is striking in how the exact opposite is true of the Narendra Modi government. Over-promise and under-deliver – that is a pithy summary of the economic outcome of the last five years as we approach the general election. The year 2014 was a heady time for dreamers. After a long time, a politician was making economic development the core plank of his election campaign. Not caste or religion but a simple and powerful promise – of making everyone’s lot a bit better and weeding out corruption. Five years later what is the economic scorecard of the Modi government? We look at certain key indicators about the economic health of the country based on publicly available statistics from government or international sources. 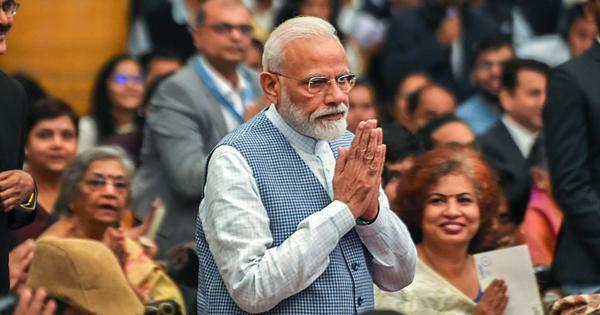 One of Modi’s main promises was to revive the economy and reverse the economic slowdown in the last years of the United Progressive Alliance government led by the Congress. What has been the outcome? We have had different estimates of Gross Domestic Product growth by different organisations such as the Reserve Bank of India, World Bank and Central Statistics Office. One notes, in particular, how in December 2018, the NITI Aayog in a highly unusual move released revised GDP figures attributed to the Central Statistics Office which showed that the average growth rate over the same period was slightly higher (7.3%) than previous official estimates. Then, with only months left before the general election, the Central Statistics Office put out yet another set of revised estimates on January 31 that bumped up the average annual growth rate to 7.7%. 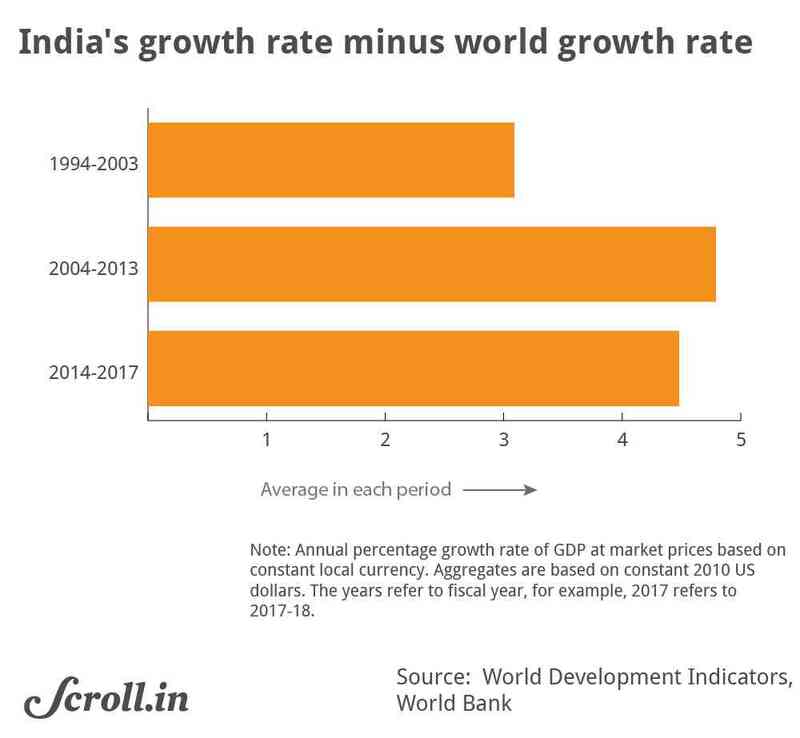 However, if one looks at the World Development Indicators dataset of the World Bank, the reality is that in the last 15 years, India’s GDP growth rate has been above 7% in all but five years. According to the World Bank dataset, which is considered one of the most authoritative internationally, India’s growth rate dipped below 7% right after the global financial crisis, the last three years of the previous government (the so-called policy paralysis phase), and in the year after demonetisation. For a man who promised to unleash India’s economic might on the world stage using the magic of Modinomics, to now boast of an average growth rate – slightly above 7% according to the World Bank data, slightly below 7% according to the earlier Central Statistics Office estimates presented in the latest RBI Handbook, and 7.7% according to the latest revised Central Statistics Office estimates – as a badge of achievement will not persuade anyone except the most diehard believers. If we use a different benchmark and compare India’s growth rate with the average growth rate across the world, the last four years do not stand out. Yes, India is one of the fastest growing economies in the world but that was true in the previous decade too. The gap between India’s growth rate and the global average growth rate or the South Asian average growth rate has, according to the World Bank database, shrunk, not widened, between 2014 and 2017 compared to what it was in the decade before 2014. In contrast, Bangladesh and Vietnam have improved their relative growth performances with respect to the world average over the last four years compared to the decade before. The debate about GDP growth rates, however, is really a distraction from the various indicators of the enormous distress affecting the majority of the population today. That really is Modi’s biggest failure, the number of people who are worse off after his tenure, which no statistical chicanery about abstract indices like the GDP can hide. Therefore, his economic scorecard is best assessed through the prism of what it has meant for Indian citizens rather than through a statistical debate on current and past GDP numbers. Livelihood is the core issue for the majority of the population. The promises about livelihood were ambitious: 250 million jobs over 10 years, or 25 million jobs a year. If we look at a Centre for Monitoring Indian Economy series based on household surveys that is available since 2016 but does not go back before that, the number of employed people declined from 406.7 million in 2017 to 406.2 million in 2018 (and dropped further to 400 million in February 2019). In 2017, at least 1.8 million jobs were added but that is only 12% of the net addition to the pool of job-seekers, and a mere 7% of the annual job creation figure of 25 million promised by Modi. For 2016, the corresponding figure was 1.4 million. A smaller sample of jobs data reported by companies, the CMIE’s Prowess dataset, shows an average pace of job growth of 1.9% between 2014 and 2018, which is lower than the average for the decade before 2014. Note: This is for the age group of 15 and above. The usual status is principal status plus subsidiary status. Source: Media reports of the National Sample Survey Office's Periodic Labour Force Survey 2017-18. We are grateful to Somesh Jha of Business Standard for sharing the data with us. In the absence of the full report being accessible we cannot judge the comparability of the data from the current round with those of past rounds in terms of any changes in sampling methodology. If we look at data from government sources, then according to the Labour Bureau, the unemployment rate was at 3.7% in 2015-’16. According to press reports on the latest National Sample Survey Office survey, the unemployment rate was at a four-decade high of 6.1% in 2017-’18. No wonder this report too is being withheld by the government despite having been approved by the National Statistical Commission. Two members of the commission have resigned in protest against the government’s refusal to release the report. More alarmingly, nearly one in five rural or urban youth are unemployed, according to this data. The data, coming as it does from official sources, conclusively proves the Modi government’s track record on employment generation is nothing but an abysmal failure. In urban and semi-rural India, where approximately 15 million young people are entering the job market every year, this has created an environment of frustration and disillusionment. The government’s reaction has been to suppress this data, at least until the election is out of the way, but now the truth is out in the open. This has also shaken the international community’s faith in India’s statistical apparatus which may have far-reaching implications. 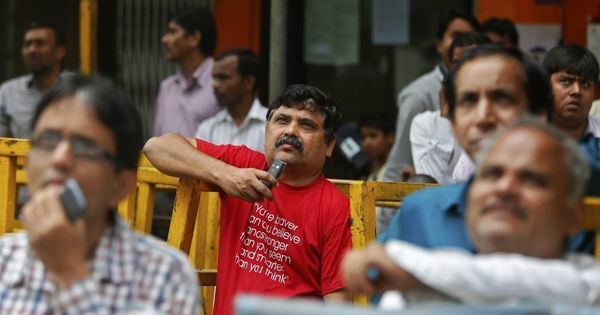 Recently, 108 noted economists from across the world wrote an open letter complaining that Indian statistics were being manipulated for political considerations. The problem is far worse, of course, in the agricultural sector that accounts for over half of India’s workforce. Modi’s assurance to Indian farmers had been clear: 50% profit over their cost of production and doubling of farm incomes by 2022. Not only has this not been delivered, the Indian farm sector is crippled by a widespread crisis. 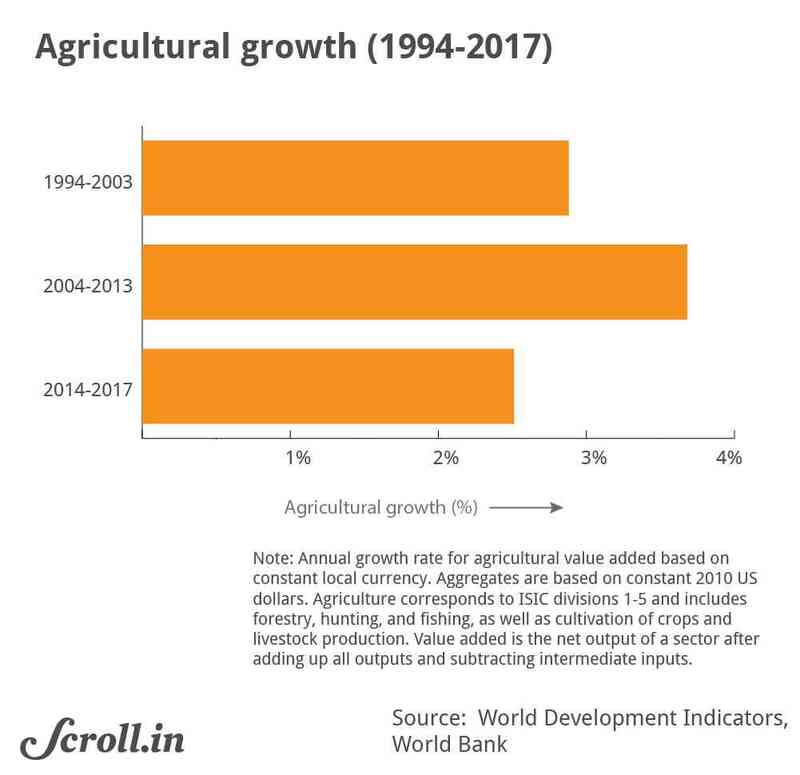 At an average of 2.51% for 2014-’17, agricultural growth has been much lower under the Modi government compared to the previous decade (2004-’14) when growth averaged 3.7% or the decade before (1994-’04) when the average was 2.88%. It follows from simple mathematics that to double something in eight years, a sustained growth rate of at least 9% is needed. Short of an agricultural revolution this was an absurd promise to start with, and the performance is below par even by the performance of previous regimes. Rural wage growth rates are at a 10-year low and in 2018 growth was less than the rate of inflation, that is, it was negative in real terms. Prices of agricultural produce have increased at a much lower rate than that of non-agricultural goods over this period, and in the post-demonetisation period, crop prices have tended to be deflationary. This has squeezed rural incomes and purchasing power relative to the non-agricultural sector. Demonetisation cut off rural menfolk’s migration options, exacerbating what is surely one of the most severe agrarian crises of recent years. The other major economic fault line of the last five years is the abysmally low growth of the corporate sector and its unwillingness or inability to invest in new capacity and jobs. Curiously, even as the GDP numbers supposedly continue to grow at a reasonably healthy rate, at least as per declared data, corporate profits have languished over the last four years. And, most companies have massive unutilised capacity, which is why they are loath to invest in more. The Gross Capital Formation, which is the investment in plant and machinery, has dropped sharply from 34.3% of the GDP in 2014 to 30.7% in 2017. 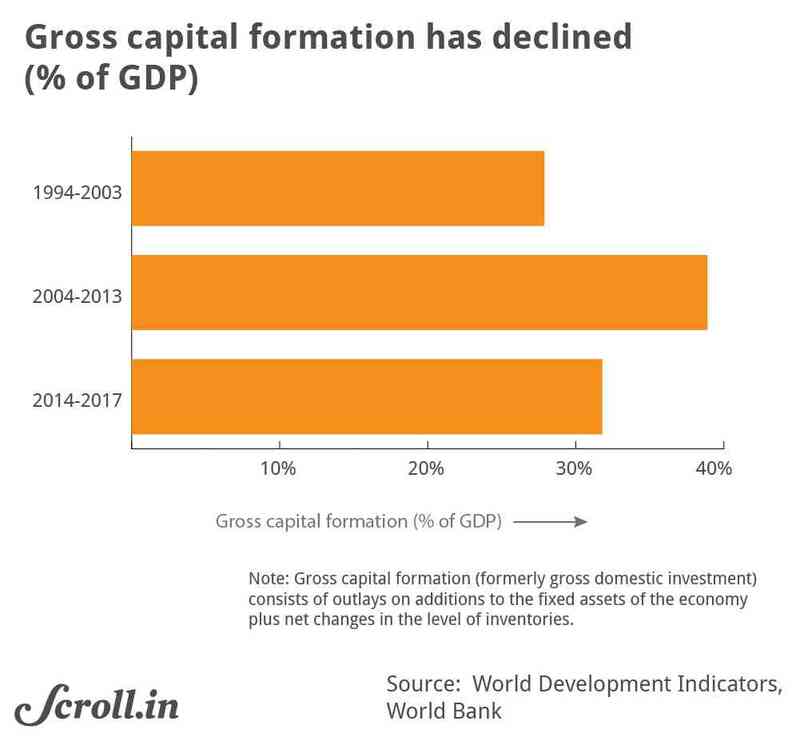 The average of Gross Capital Formation as a percentage of the GDP during the Modi era is 31.8%. This is considerably lower than the average during the decade of United Progressive Alliance rule of 39%. Non-food bank credit charted an abysmally low trajectory through the last four years, stifling economic growth. If we look at the growth rate of credit to only industry, the overall pattern looks similar to non-food bank credit but the numbers look even worse. When companies do not build new capacities and credit dries up, jobs vanish, which is precisely what is happening today. If we look at other sources of demand that could potentially provide a boost to the economy, such as exports, there too we see a dip in performance under the Modi regime. 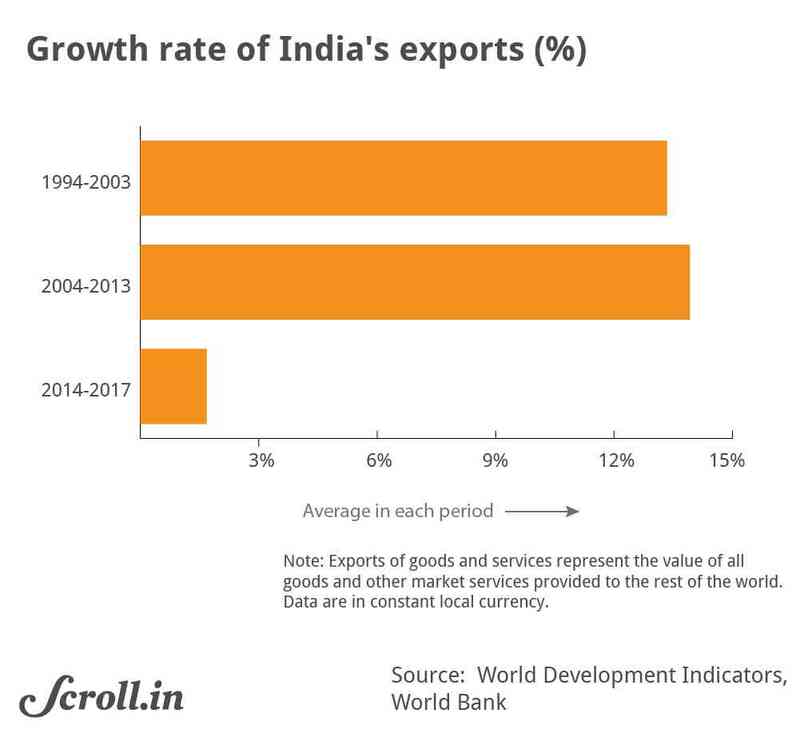 Since 2014, Indian exports have grown at a dismal average pace of 1.6%, while in the two decades preceding that, it was 13% to 14%. This, in turn, has led increased India’s current account deficit to 2.9% of the GDP, the key reason behind the rupee’s collapse to 70 versus the American dollar. Yet, comparing across the same periods, countries such as Bangladesh and Vietnam were able to improve their performances in this dimension. Scaling up labour-intensive manufacturing exports has helped them address their unemployment problem, an area where we have failed. “Make in India” sounds good as a slogan, but in reality the economic outlook under Modi seems to be more like “Mess in India”. Outside the organised sector, the problem is graver. Medium and small enterprises and unorganised units were dealt a deathly blow by the prime minister’s demonetisation scheme and have not yet recovered. The CMIE estimates that 3.5 million jobs were lost in the unorganised sector in the aftermath of demonetisation. A ham-handed implementation of the Goods and Services Tax has only exacerbated this trend. Add to this the government’s pathetic attempts at revamping the country’s education system to ensure new graduates are employable. Government expenditure on education as a percentage of the GDP has dipped in the four years of the Modi government and almost all news about education is about government interference with the running of institutions of higher education, saffronisation and a backward looking, “it-was-all-discovered-in-ancient-India” approach to science and technology. Yet, this is not the full picture. To start with, it is shocking that we do not have any government estimates of poverty since 2011-’12. That aside, what must be even more rankling for millions of Indians struggling to eke out a modest livelihood is how fast the wealth of the rich keeps growing. According to the World Inequality Database developed by Thomas Piketty and his colleagues, in India the share of the bottom half of the population in total wealth is 6.4% according to the latest available data. In contrast, the share of the top 1% in total wealth is 30%. Not surprisingly, the share of these groups in national income shows a similar gap: the bottom 50% earn only 14.6% while the top 1% earn 21%. What is even more alarming is that the share of the top 1% has been steadily rising at a rate that is much higher than how average wealth or income has been growing. Commensurately, the share of the bottom 50% in both income and wealth has been steadily decreasing. Given this reality, making promises like “sabka saath sabka vikas” without any concrete follow-up actions adds to the pervasive sense of popular discontent with Modi’s economic record. Much is made of the government’s fiscal rectitude; how it has managed to rein in the fiscal deficit to 3.3%. Yes, the Modi government has marginally reduced the deficit to GDP ratio relative to the United Progressive Alliance. But reports from the Comptroller and Auditor General of India suggest that this is largely due to creative accounting methods to roll over subsidy data and the windfall of falling oil-prices that allowed it to raise fuel taxes without much protest. If we look at tax revenue collection, despite the government’s claim about the rise in the number of indirect tax payers due to the GST, the actual collections have not been impressive. The growth in indirect tax collections accruing to the centre in the post-GST era actually shows a decline. An examination of the Central Board of Direct Taxation data suggests no significant increase in the number of income tax payers since 2013-’14, despite the often-heard claim that demonetisation led to a large increase in the number of income tax payers. Another oft-repeated claim is that inflation was consistently higher under the previous government. Indeed, if we take the annual inflation rate in consumer or retail prices as measured by the Consumer Price Index, the average for the United Progressive Alliance period was 8.1% while that for this government is 5%. 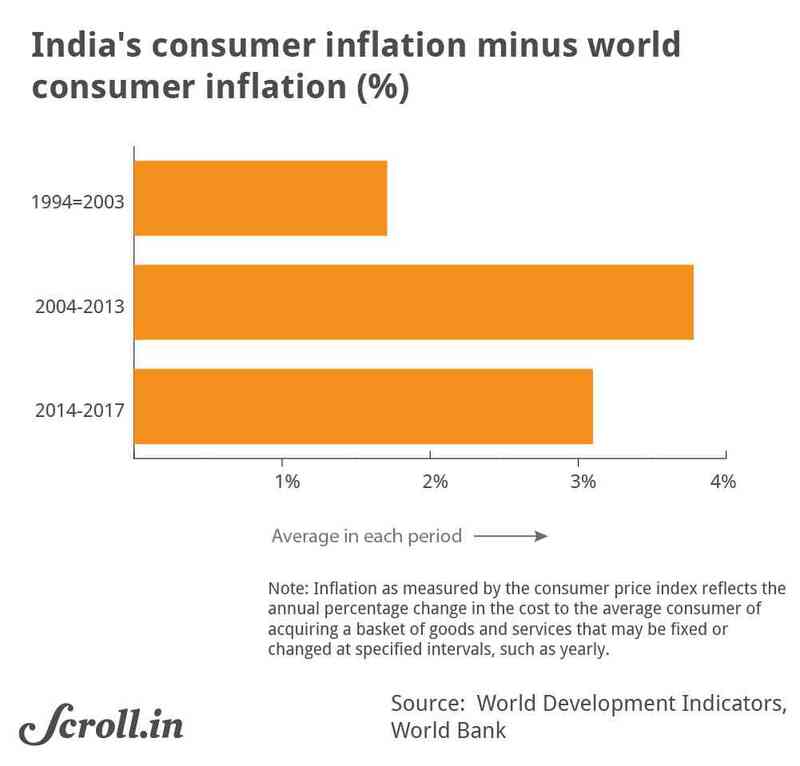 However, if we take the difference between India’s Consumer Price Index inflation rate and the world average, the corresponding figures are 3.7% and 3.1% for the two regimes. Therefore, while some credit is indeed due to the Modi government for fighting inflation, this seemingly dramatic improvement can also be partly attributed to external factors affecting the global economy. One remembers that the Modi government has been very fortunate since it has experienced a decline in oil prices during most of its tenure. It could have done so much with this lucky break but squandered the opportunity. 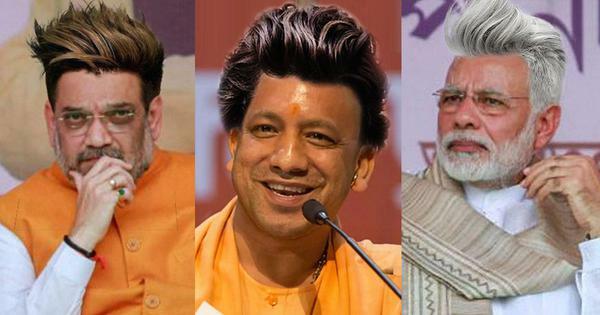 Those “reformwallahs” who held their noses in 2014 to the toxic nature of Hindutva politics in the hope that it was a price worth paying for economic reforms ignored this basic point about the economy: sustained economic growth is impossible without social cohesion and a spirit of citizenship and solidarity. Five years down the line this is what we have: job growth at a multi-year low, a farm crisis, a crippled unorganised sector, currency value at a near all-time low, a soaring current account deficit, high interest rates, a half-frozen banking system, a sputtering tax regime, a struggling corporate sector, sinking exports and a GDP growth rate that, for all the constant revisions and data controversies associated with it, does not stand out compared to the previous decade. Like the stock market, one can create a bubble by stoking expectations. However, at some point the numbers need to add up. That is why it is wise to under-promise and over-deliver, as Murthy believed. When the fundamentals are not in sync with the expectations, bubbles are bound to burst, leaving behind a wreckage of broken promises and bitter disappointments. 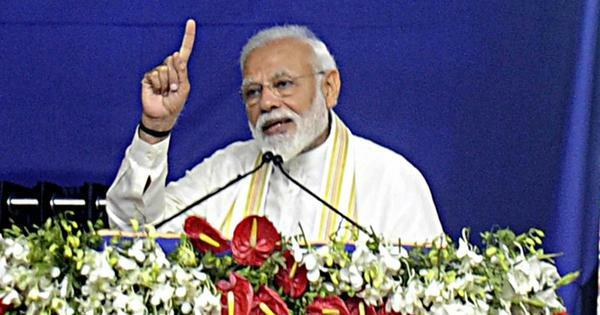 It would not only be ironic if, despite such a pitiful track record on the economy, Modi is voted back to power on the back of an exaggerated account of an air strike on Pakistan, but also make us deeply concerned about the underlying nature of our democracy and the policy choices for future governments of our country. Maitreesh Ghatak is professor of economics at the London School of Economics. Udayan Mukherjee is a television commentator and author of the novel Dark Circles. 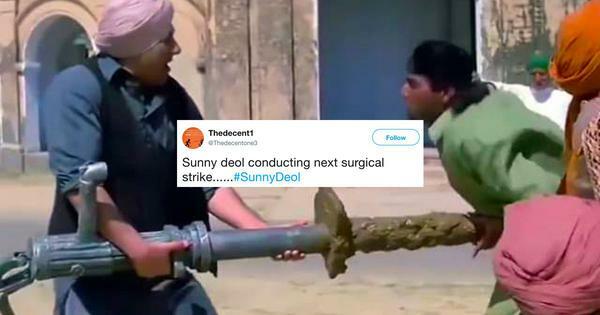 A version of this article first appeared on The India Forum. 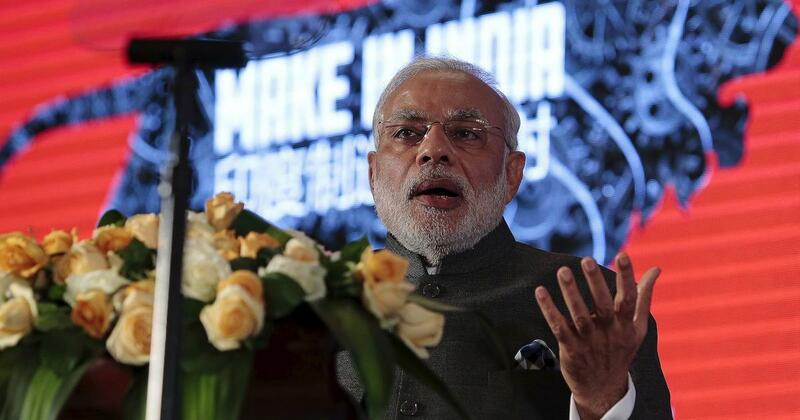 Also read: The Modi Years: Did Indians find jobs or lose them? How India Votes: Does it matter what voters think of Modi government’s economic performance?